Join 600 of your classmates on a fun adventure! Outdoor Action is an integrated part of Orientation. There is no fee to participate. Join hundreds of your classmates! Learn about Princeton, Leadership, Community, Diversity, make new friends and have a fun Adventure! What is the OA Frosh Trip? It's a 5-day orientation program for incoming Princeton students. The goals of the program are to help you get settled into Princeton, learn about what life will be like for the next four years at Princeton and make a great bunch of new friends. We also focus on leadership and diversity as part of our core mission and values. Frosh Trip is a metaphor of your four years at Princeton--bring a group of great people together, get to know each other by working together, experience some new challenges, and learn about yourself and Princeton. "I cannot tell you how glad I am that I participated in OA. I've made some really great friendships. It was a wonderful way to be introduced to Princeton and I would strongly recommend it to EVERYONE!!" "EVERYONE SHOULD DO IT. It's very fun and rewarding. You'll learn a lot, and your leaders will really help to ease you into Princeton and answer your infinite amount of questions about everything. It's refreshing to be outside and disconnected from e-mail, Facebook, etc. for a week. Incredibly well-planned, truly a paragon of organization. One of the best experiences of my life... so far." Diversity is one of our big goals so we make sure we have trips for every kind of person and all fitness levels. The huge diversity of students on OA are what makes it such a great experience. Being in a small group with 8–10 of your new classmates that is led by 2–3 upperclass leaders provides a great atmosphere for developing group co-operation and close friendships. You will learn an incredible amount about this group of people by living and traveling with them each day. You will learn all about life at Princeton from your leaders and make a great new set of friends. The friends you'll make in your group are just the beginning. You'll meet other students who went on Frosh Trip, their roommates and friends, your Leaders' friends and roommates, etc. All of this starts with a fantastic five-day outdoor trip. 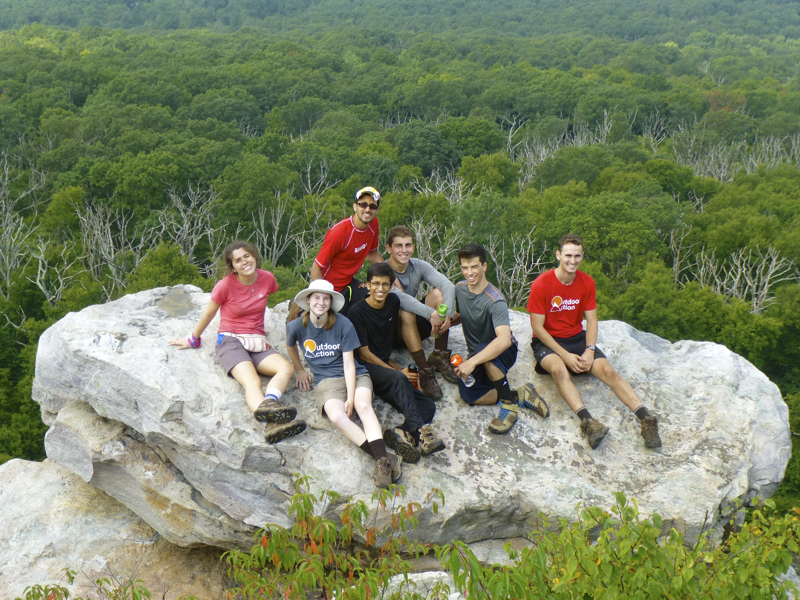 You don't need any previous outdoor experience to participate, which is why so many incoming students come on the trip. OA is a perfect first adventure in the outdoors. "I think meeting other people of different backgrounds, and seeing the diversity of people that come to Princeton was really important." "I feel so lucky that Princeton has such a program and that I had the chance to participate. I became so relaxed on Outdoor Action. I felt truly welcome and at home. I’m so excited to start my four years." Do I Need Experience? No! 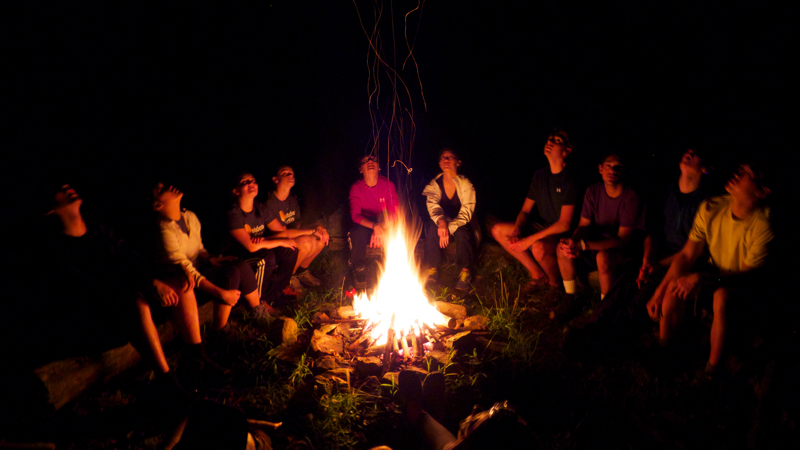 Most of our participants have never done any kind of camping trip before. They discover that the experience of meeting a new group and making friends is amplified by the simplicity of the outdoor setting. Leave your phone behind and spend the week making new friends. Our trips are all at the novice level and your trip leaders will teach you all the basic skills you will need to be comfortable in the outdoors. OA offers trips at different fitness levels: easy, moderate and challenging. Tell us what level of trip you would be most comfortable with and we'll place you in an appropriate trip. "Although I'm not an outdoor girl, I loved the trip. I loved the people. I loved the whole experience. Would I do it again? In a second." "Although I didn't have much outdoor experience, I'd heard great things about the trip and I was interested in trying something new. I also thought it would be a great way to meet new people before orientation actually started. Everyone on my trip was amazing. There was such a diverse group of interests and it made for great conversation." OA Leaders cover every spectrum of the Princeton student body, they are artists, engineers, athletes, dancers--from every major and academic discipline. They volunteer their time to come back to campus two weeks early to lead these trips and they love helping incoming students learn about Princeton. OA Leaders complete a comprehensive Leader Training Program to learn how to effectively lead groups in the outdoors and facilitate team building. "Talking with OA leaders about their experiences at Princeton really helped to ease the transition into college. I feel that OA really helped me to become more comfortable and more prepared for the college atmosphere, and it made me less nervous about starting my freshman year at Princeton." "My two leaders were absolutely amazing. Their outdoor knowledge, ability to work with the group, and their overall enthusiasm made the trip an incredible success." "I really appreciate my OA group's bond now that we're back on campus; the 10 of us hang out all the time and now I've met my OA friends' roommates and other friends, so my circle of friends is growing. All the same, it's great to be comfortable with those 10 kids (and our 2 A-mazing leaders!) on a campus where I would have otherwise known no one." Our trips take place in a range of outdoor venues from base camp trips at a summer camp to backpacking trips on the trail. We've used the outdoors as a bonding experience for over forty years and it's proven to be a great vehicle for bringing people together. You'll learn a lot about the people in your group and your trip leaders by working together each day. Our trips are geared towards people who have never been in the outdoors before so you don't need to have any previous experience. Our trips range from easy to moderate and all the way up to challenging so you can select the activity level you prefer. "Coming from a family not inclined to outdoor activities, I got my first taste of hiking and camping from the OA Frosh Trip. By living with the same group of people for five days, by doing everything together-- cooking, cleaning up, eating, hiking, sleeping, setting up camp, making daily decisions-- a community is formed." "Going all those miles with a backpack on, reaching 2,060 ft., seeing heaven-like views, all give one a sense of awe and accomplishment. Before this trip I wouldn't have imagined that I could ever do all of this." Frosh Trip is all about building relationships. We believe that making a successful transition from home and high school to college means building strong, supportive relationships before school begins. That's what we've been doing for over 42 years. We bring the incredibly diverse incoming class together to share in a common experience. That means meeting people who you wouldn't ordinarily meet. Expanding the diversity of your friends is one of the special things about Princeton and OA is a great place to start. Our leaders work to create a safe and supportive environment for everyone on the trip--wherever you are from, whatever your background. We think that everyone grows best with a little bit of challenge and we include some challenge on all of our trips. We live by the motto "challenge by choice" so you get to pick how much you want to challenge yourself. By the end of the week you'll be amazed at what you've accomplished that you never imagined when you first arrived on campus. Finally, we focus on leadership. We want every participant to take on leadership as the trip progresses and your leaders will help you develop the skills you need to be self-reliant in the outdoors and on campus. OA offers two types of trip experiences. These trips generally travel from place to place each day and camp out. You'll explore some of the most beautiful outdoor areas of the east coast ranging from Virginia to Vermont. Sidecountry Trips may stay in a single location (like a base camp or summer camp) for the week or travel from place to place. They have access to bathrooms at campgrounds and may have access to showers. .